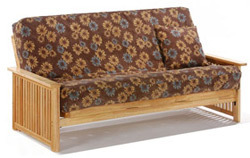 Shop our selection of high quality futon frames at incredibly low prices. We offer solid construction futons made of premium hardwood, solid oak, sleek metal, wicker, and rattan to provide every style you're looking for. Add a futon mattress and futon cover to create your own unique futon sleeper that's both beautiful and functional. We also carry complete futon sets for excellent value. FREE Shipping included!